It is the paradox between both celebrating and fighting our bodies during the training years and beyond that motivated Seattle dance studio, All That Dance, to develop Love Your Body Week at their school. “Managing and facilitating Love Your Body Week is by far one of the most rewarding parts of my job, and having it as a part of our studio calendar each year makes me proud to be a faculty member at All That Dance.” – All That Dance, ballet department leader, Mary Gorder. What Is Love Your Body Week? Love Your Body Week is an annual event on the All That Dance calendar filled with class-time activities focused on fostering healthy body image in the school’s dancers. Love Your Body Week at All That Dance was started in 2005 by Rachel Stewart after she witnessed some of her 5-year-old students comparing the sizes of their thighs. Rachel wanted to counteract the negative messages about our bodies delivered from outside sources and acknowledge the additional internal pressures that young dancers face. Rachel’s idea was received with great enthusiasm from All That Dance studio founder and director, Maygan Wurzer who has nurtured a supportive and accepting environment at her school. Rachel and fellow instructor, Emily German, turned immediately to the studio’s student leadership to help with the event. The high school dancers in their chapter of the National Honor Society for Dance Arts (NHSDA) are in the studio’s top technique levels, maintain high GPAs at school, participate in dance-focused service work, and are very involved in the studio community. Love Your Body Week has become a big part of their mission. NHSDA members spend a Sunday afternoon preparing and decorating the studio to kick off the week and visit classes to lead activities with younger dancers as well as with their peers throughout the week. Mary Gorder is the NHSDA Chapter Sponsor and oversees the facilitation of the event. She works to develop the Love Your Body Week curriculum each year. We were so inspired by Love Your Body Week, its mission and implementation, that we asked Mary some questions with hope that it will inspire you, too! Dance Advantage: For over 10 years this program has been a part of the culture at All That Dance. When does the positive impact of LYBW became crystal clear for you? Mary Gorder: I think what shows Love Your Body Week’s impact the most is how much of a normal part of our school year the event has become. The dancers who are now in charge of facilitating LYBW activities first experienced it when they were six or seven years old, and they do not remember a time before LYBW. When I announce in class that LYBW is coming up, the response is just as enthusiastic as when I tell dancers that we are starting choreography for a performance. One of my favorite things to overhear in the hallways or lobby between classes are the moments in which dancers remind each other of LYBW’s message throughout the year. Numerous times I have heard a dancer start to speak poorly about him/herself, only to be met with a chorus of peers shouting “LOVE YOUR BODY!”. This is not to say that we can prevent our students from ever experiencing feelings of self doubt or of a negative body image. But it is our hope that by creating an environment that encourages self acceptance, we can help them to have the strength to overcome such negativity. As a studio community we value support over competition, and Love Your Body Week is one facet of that mission. LYBW allows for impactful movement experiences as well. For example, every year I use the same improvisation exercise in all of the teen lyrical levels I teach. I ask dancers to start with some journaling about a body part they love, then about one they don’t. Next, they watch each other improvise first using their favorite part as an initiation point, then their least favorite, then both. 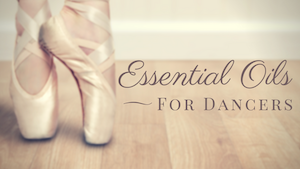 I am struck every year by how much power this seemingly simple exercise holds, especially for our most advanced teens who have danced the same exercise a number of times over the years. In each dancer I see such courage, intention, and passion. The fact that these students are brave enough to dance so fearlessly and with so much heart is overwhelming to me each and every time. I am so proud to teach at a studio that has created a safe space for these young artists to move, explore, and express, and this exercise always exemplifies and reinforces that for me. DA: Tell us a bit more about NHSDA, which is a program of the National Dance Education Organization, and what that’s brought to your studio culture. MG: Our NHSDA chapter is made up of our higher-level teen students, mostly Juniors and Seniors in high school. Our goal is to use NHSDA to promote community, leadership, scholarship, and service among our students. Aside from LYBW, NHSDA hosts events for younger dancers (a sleepover and “parents’ night out”), and teach classes to children staying at our local Ronald McDonald house while in treatment for serious illnesses. They also attend performances as a group, and read and write about dance. They produce a concert of student choreography each winter, and create collaborative group choreography for our studio-wide shows in the spring. NDEO’s support has been integral in the development of our teen programming this these past few years. Having an NHSDA chapter has allowed us to create exciting opportunities for our most advanced dancers, who are looking to commit time and energy to dance outside of their classes and rehearsals. We love that it gives these dancers a chance to build closer relationships with their peers, which in turn helps to strengthen our community as a whole. It creates greater investment from our oldest dancers, as well as great modeling for the younger ones. Teens serve as such powerful role models within the context of our studio, and the opportunity to connect them directly with little ones is incredibly influential across our whole community. We hear from young dancers not only that they want to someday dance with our company, but also that they want to be NHSDA members to help carry on the LYBW tradition. DA: What does a typical Love Your Body Week at the studio usually looks like? MG: Most of these activities happen during class time, with the exception of the prep work that NHSDA members do before the week begins. We offer a variety of different jumping-off points for conversation in classes based on age and dance genre (picture books for our pre-school dancers, photos, videos, and readings for pre-teens and teens). For our older dancers who experience a number of conversations over the course of the week, we also incorporate movement exercises, both choreographic and improvisational, to create a well-rounded experience. Our goal is for dancers who take multiple weekly classes to examine the concept of body image through a variety of different lenses. NHSDA members visit classes over the course of the week to lead LYBW activities. There are generally about 20 members in a given year, and they facilitate conversations in pairs or trios. NHSDA members visited over 100 classes over the course of the week this year, so it is certainly a substantial time commitment for those dancers. We are intentional about taking time to fully prepare NHSDA dancers l to help them feel confident and prepared, as well as offering them resources and support throughout the week. Jazz – Video and discussion of dancers as athletes. Modern – Choreographic task inspired by a word each dancer chooses to describe his/her body. Ballet – Photo timeline of the evolution of the “ideal ballet body”, discussion of how these ideals (for both male and female dancers) have changed over the course of history. Tap – Discussion of body positivity from the perspective of thankfulness. Dancers write thank you notes to their bodies to post on the mirror. Lyrical – Dancers choose a favorite body part and a least favorite body part, then improvise movement initiating with each of those parts. DA: Do you incorporate wellness/nutritional education? MG: In general, we do not incorporate much from a nutrition standpoint, as we are not experts in the field and do not want to inadvertently offer potentially damaging advice. In general the conversations will touch on the importance of eating well to keep active bodies fueled, but nothing more specific than that. We are lucky enough to have Rachel Stewart, who also works with children and teens as a counselor, as a part of our LYBW program. She offers an info session at the end of each LYBW so that parents and teens can access clinical resources. DA: Has the event grown beyond All That Dance? MG: A number of other studios across the country have contacted me for more information, and many have instituted similar programs at their studios. I am happy to share our curriculum with anyone who is interested! I love having the opportunity to share our materials, and to discuss ways of implementing similar programming in the context of other studios. The best way to contact me is via email: maryp@all-that-dance.com. DA: What resources or sources you can suggest to studios interested in helping students love their bodies? MG: The National Eating Disorder Association has a website with tons of fantastic links and resources. We have also had great success searching for inspiring quotes and articles on Pinterest. Dance Magazine and Dance Teacher Magazine have published wonderful articles about body image, building confidence, and using studio mirrors as helpful tools that can be found on their respective websites. There are of course several fantastic articles on Dance Advantage, too! Through Love Your Body Week, All That Dance students are learning to be kind to one another and kind to themselves, as well as developing an appreciation for their bodies. They will take these lessons into college and adulthood, making time spent in the dance studio about even more than technical proficiency, discipline, and work ethic. What an amazing gift! How do you promote healthy body image at your studio? How absolutely amazing this is!!! I am the founder of The Whole Dancer where I offer online programs for dancers in the area of healthy eating, positive body image and mindset! So if anyone is looking for support but isn’t able to get it at their studio, I’d love to help out! I’m a health coach and former professional ballet dancer. What a wonderful initiative! I love it! Hope more schools get into it. Another tool I have used with older students in Body Image workshops is to get them to draw a caricature of themselves (i.e.) with parts exaggeratedly bigger/smaller/rounder/pointier etc. than in real life, and talk about how our perception of how we look is often different to reality. This could work well with a modern improvisation following this too, making exaggerated shapes and then again from a more realistic perspective of your body in space! I’m inspired! And Jessica and Phillippa above – your work sounds great too! Such a positive impact you all are having on young dancers. Such and amazing idea and cause to take up especially in our sport that is so concerned with size. I love this idea, especially starting young to teach our girls to love their bodies. Thank you for sharing!